A car accident in Rockland County killed one pedestrian and gravely injured another in Sept. 2016. The family of the surviving victims is asking if police did the proper field tests and if there was special treatment because one of the drivers was an off-duty police officer. Jonathan Dienst reports. The family of a yeshiva student critically injured in an accident in Rockland County last September is questioning how the police accident investigation was handled. They are alleging special treatment because one of the drivers involved in the crash was an off-duty police officer. With alcohol and prescription pills for an illness found in one car, the family of surviving victim 19-year-old David Maldonado alleges the Ramapo Police Department should have conducted a breath test or field sobriety test on off-duty police officer Jonathan Mosquera and the second driver Tzvi Hakakian. Accident scene photos and the police report show an opened bottle of cognac was in the trunk and prescription pills for a virus were present in the car of the off-duty officer. But officials defend the lack of a field test saying both Mosquera and Hakakian had no obvious signs of impairment. In addition to injuring Maldanado, the accident killed yeshiva student Marcos Tawil. Both students were standing along State Route 202 near Haverstraw Road. Research by the I-Team shows in past fatal accident investigations by the Ramapo Police Dept., officers did conduct a field test on driverbs to try to detect the presence of alcohol. But in the Route 202 fatal crash, that test was not performed. 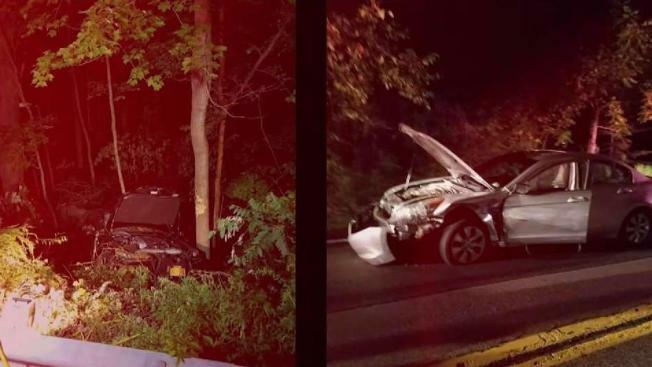 It was nearly midnight on Route 202, and according to the accident report obtained by the I-Team, Officer Mosquera was on his way to begin the night shift with the Peekskill Police Dept. Mosquera admitted to driving 64 mph in a 50 mph zone. Ahead of him, Tzvi Hakakian was approaching a yeshiva, where students were standing by the side of the road. Mosquera was driving his Lexus sedan and attempted to pass Hakakian, who may have been over the double yellow line and slowly turning left into the Yeshiva. The two vehicles collided. Accident reports say Mosquera’s car ended up striking the two pedestrians with his car, prior to landing in a ravine. The reports say 17-year-old Tawil died while in transport to Good Samaritan Hospital. Maldonado was severely injured, suffering broken bones and severe cuts. Inside one car, investigators found a pill bottle with opioid painkillers and a half empty bottle of Hennessey Cognac. The accident report says it was in the trunk of Mosquera’s car. Additionally, beer bottles were photographed lying just outside Mosquera’s driver’s side door. Beer bottles were photographed lying just outside Mosquera’s driver’s side door. The accident report indicates that neither driver was physically tested for possible alcohol impairment. Maldanado’s father said with alcohol at the scene and painkillers in the car, Mosquera should have been tested. “They didn't check to see if he was impaired,” Maldonado said, claiming they only said, "Oh, I didn't smell liquor on him." The I-Team requested a copy of the Town of Ramapo Police Dept. 's General Orders, which act as a policy guide for police officers while on the job. The test is done by asking a driver to blow into a device that could detect the presence of alcohol. Test results are not admissible in court. But sources in multiple law enforcement agencies tell the I-Team that an Alco-Sensor test provides probable cause for investigators to conduct further sobriety tests, like a full-blown breathalyzer or blood test. As for the beer bottles lying next to the front door of Mosquera’s car, it is unclear if they were open, were there coincidentally or related to the accident. The beer bottles are never mentioned in the accident report. When the I-Team requested the accident report from the Ramapo Police Department, the official copy sent by the Town of Ramapo blacked out any mention of alcohol and pills. In the fifth accident, the driver of the single car accident struck a guard rail and died at the scene, so no test was possible. In the sixth and last accident found by the I-Team, Ramapo officers weren’t aware of a fatality at the hospital until after they returned to the police station (see map and chart below). The accident reports provide a track record of Ramapo officers conducting Alco-Sensor tests in past fatal accidents, as advised by the department’s General Orders. This accident was nothing more than that: a tragic accident. The investigation revealed that both drivers bear some level of responsibility for the death of the young man. Truthfully, these conspiracy theories are being perpetuated simply because Jonathan Mosquera happened to be an off-duty police officer. Had the investigators asked officer Mosquera to consent to a breath test, he would have agreed. All medical personnel who observed and treated Mosquera agreed that he exhibited no indicia of impairment. But Maldonado says he still has questions. “The badge should not give you special privilege,” he said.